Last week, Intel officially launched their first Optane product, the SSD DC P4800X enterprise drive. This week, 3D XPoint memory comes to the client and consumer market in the form of the Intel Optane Memory product, a low-capacity M.2 NVMe SSD intended for use as a cache drive for systems using a mechanical hard drive for primary storage. 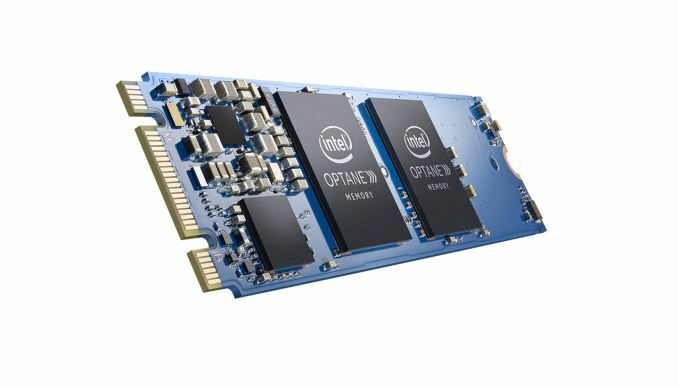 The Intel Optane Memory SSD uses one or two single-die packages of 3D XPoint non-volatile memory to provide capacities of 16GB or 32GB. The controller gets away with a much smaller package than most SSDs (especially PCIe SSD) since it only supports two PCIe 3.0 lanes and does not have an external DRAM interface. Because only two PCIe lanes are used by the drive, it is keyed to support M.2 type B and M slots. This keying is usually used for M.2 SATA SSDs while M.2 PCIe SSDs typically use only the M key position to support four PCIe lanes. The Optane Memory SSD will not function in a M.2 slot that provides only SATA connectivity. Contrary to some early leaks, the Optane Memory SSD uses the M.2 2280 card size instead of one of the shorter lengths. This makes for one of the least-crowded M.2 PCBs on the market even with all of the components on the top side. The very low capacity of the Optane Memory drives limits their usability as traditional SSDs. Intel intends for the drive to be used with the caching capabilities of their Rapid Storage Technology drivers. Intel first introduced SSD caching with their Smart Response Technology in 2011. The basics of Optane Memory caching are mostly the same, but under the hood Intel has tweaked the caching algorithms to better suit 3D XPoint memory's performance and flexibility advantages over flash memory. Optane Memory caching is currently only supported on Windows 10 64-bit and only for the boot volume. Booting from a cached volume requires that the chipset's storage controller be in RAID mode rather than AHCI mode so that the cache drive will not be accessible as a standard NVMe drive and is instead remapped to only be accessible to Intel's drivers through the storage controller. This NVMe remapping feature was first added to the Skylake-generation 100-series chipsets, but boot firmware support will only be found on Kaby Lake-generation 200-series motherboards and Intel's drivers are expected to only permit Optane Memory caching with Kaby Lake processors. Intel has published some specifications for the Optane Memory drive's performance on its own. The performance specifications are the same for both capacities, suggesting that the controller has only a single channel interface to the 3D XPoint memory. The read performance is extremely good given the limitation of only one or two memory devices for the controller to work with, but the write throughput is quite limited. Read and write latency are very good thanks to the inherent performance advantage of 3D XPoint memory over flash. Endurance is rated at just 100GB of writes per day, for both 16GB and 32GB models. While this does correspond to 3-6 DWPD and is far higher than consumer-grade flash based SSDs, 3D XPoint memory was supposed to have vastly higher write endurance than flash and neither of the Optane products announced so far is specified for game-changing endurance. Power consumption is rated at 3.5W during active use, so heat shouldn't be a problem, but the idle power of 0.9-1.2W is a bit high for laptop use, especially given that there will also be a hard drive drawing power. 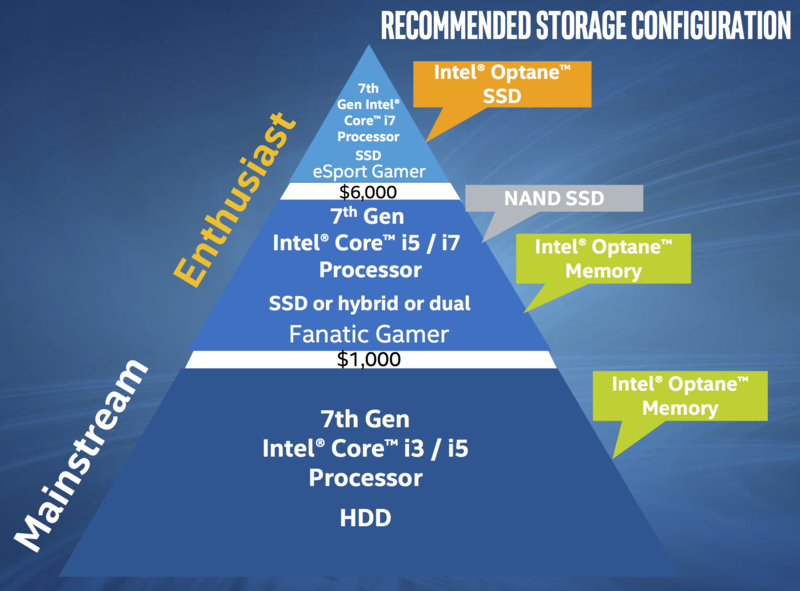 Intel's vision is for Optane Memory-equipped systems to offer a compelling performance advantage over hard drive-only systems for a price well below an all-flash configuration of equal capacity. The 16GB Optane Memory drive will retail for $44 while the 32GB version will be $77. As flash memory has declined in price over the years, it has gotten much easier to purchase SSDs that are large enough for ordinary use: 256GB-class SSDs start at around the same price as the 32GB Optane Memory drive, and 512GB-class drives are about the same as the combination of a 2TB hard drive and the 32GB Optane Memory. The Optane Memory products are squeezing into a relatively small niche for limited budgets that require a lot of storage and want the benefit of solid state performance without paying the full price of a boot SSD. 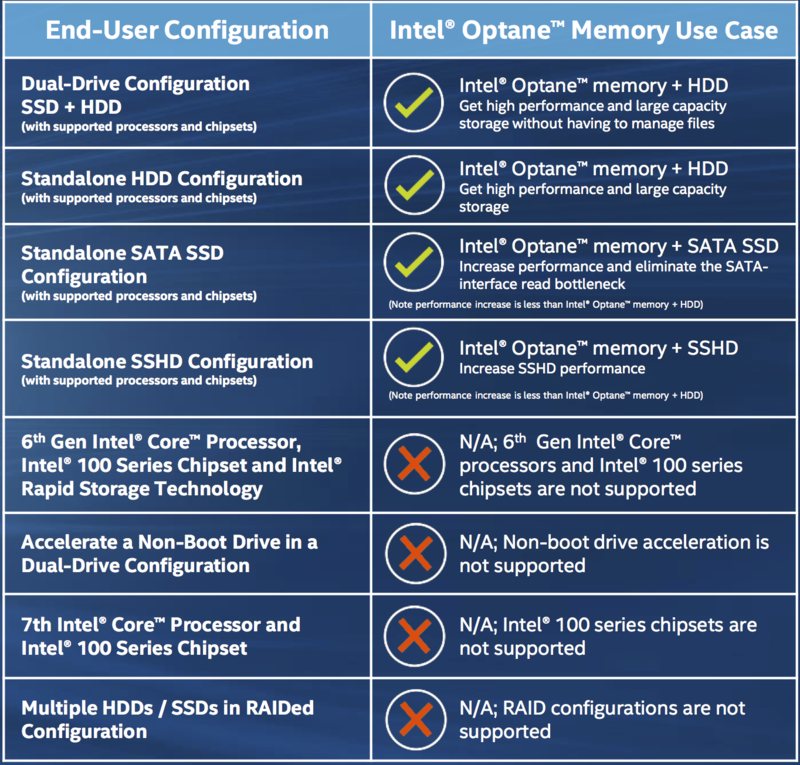 Intel notes that Optane Memory caching can be used in front of hybrid drives and SATA SSDs, but the performance benefit will be smaller and these configurations are not expected to be common or cost effective. The Optane Memory SSDs are now available for pre-order and are scheduled to ship on April 24. Pre-built systems equipped with Optane Memory should be available around the same time. Enthusiasts with large budgets will want to wait until later this year for Optane SSDs with sufficient capacity to use as primary storage. True DIMM-based 3D XPoint memory products are on the roadmap for next year. As with any cache, data that is frequently or recently used can be accessed more quickly from the cache device than from the larger, slower device. Intel's hope is that ordinary desktop usage is mostly confined to a relatively small data set: the OS, a few commonly-used applications, and some documents. it feels like a product searching for a reason to exist. Keep in mind that consumer NVMe SSDs that boast throughput of 2GB/s or more generally do not reach their peak at low queue depth. Optane is supposed to be able to drive 1200MB/s read throughput at low queue depth (not sure why they listed QD4), so there is potential for some performance improvement here. Most consumer workloads never get out of low queue depth territory, so this could have some small real world benefit. Write throughput, however, is critically low. More importantly, these Optane drive are gear more towards lowering latency than transferring large files. Where HDDs access the data on the order of 10s of mS and SSDs access data on the order of 1mS (give or take), Optane should be able to access data on the order of 1s - 10s of uS. Where Optane will be useful is high numbers of small file accesses (DLLs, library files, etc.). SLC is MUCH better than hypetane. Double the endurance, 1/100 the latency. It will we a big step back to replace SLC cache with xpoint. What the industry should really do is go back to SLC in 3D form. Because it doesn't look like xpoint has a density advantage either, as it is already 3D and it takes 28 chips for the measly 448GB. Samsung 960 pro has 2 TB in 4 chips. Sure that's MLC, which is twice as dense as SLC. Meaning that with 3D SLC you could have a terabyte in 4 chips. Now, if you get short of 0.5 TB of xpoint with 28 chips, and you get 1 TB of much faster, durable and overall better SLC with 4 chips, that means it would take like 60 chips to get a TB with xpoint. Making potential 3D SLC "ONLY" 15 TIMES better in terms of density, while still offering superior performance and endurance. Which begs the question, why the hell is intel pushing this dreck??? My guess, knowing the bloated obese lazy spoiled brat they are, they put a shameful amount of money into RDing it, and how they are hyping the crap out of it in order to get some returns. They most likely realized its inferiority way back, which prompted them to go for the hype campaign, failing to realize despite (or because of) their brand name, that would do more harm than good the moment it fails to materialize. Which it did - I mean look at how desperate they are at trying to find a market for this thing.